Known as the Heritage of Nature in the world. Halong Bay is the place of the amazing beauties, the attraction of magic and history. In this land, you will be enjoyed the wonderful timelines, in the most luxury standard. Your journey will be full with the endless activities list. Let you never worry about where to go in Halong Bay. 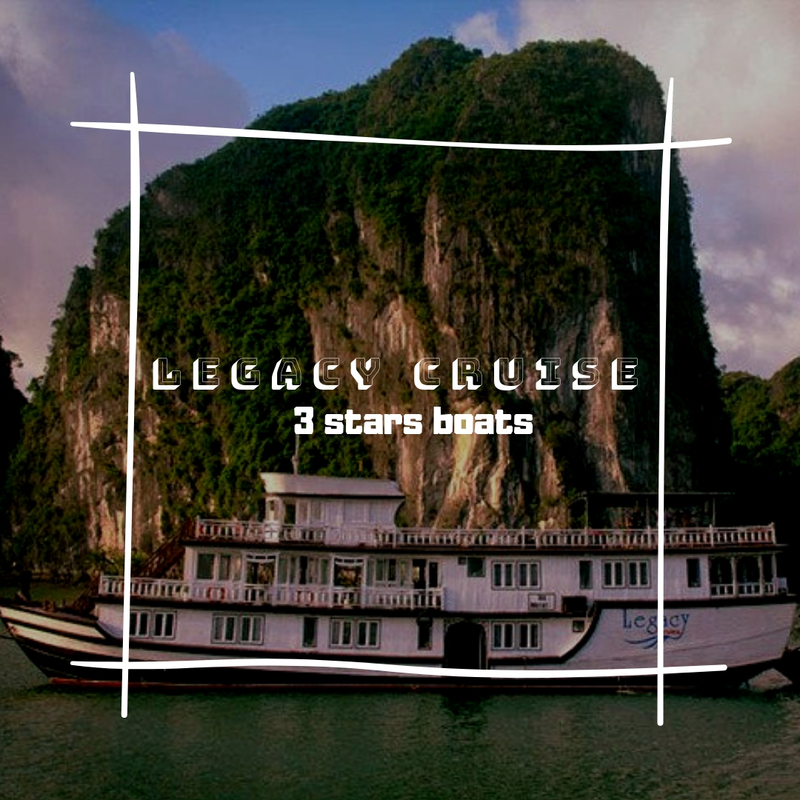 Legacy Cruise – one of the most valuable journeys in Halong Bay, with the recommend choice of tourists on TripAdVisor. Sure it will take you in to dreamlike cruise to exploring unlimited beauties of HaLong Bay. Each of your days in this boat will be another life – that only having the enjoyment and surprised knowledge. Although is the 3 stars boats, but in Legacy Cruise you still enjoyed the basic luxury life as you have been looking for. 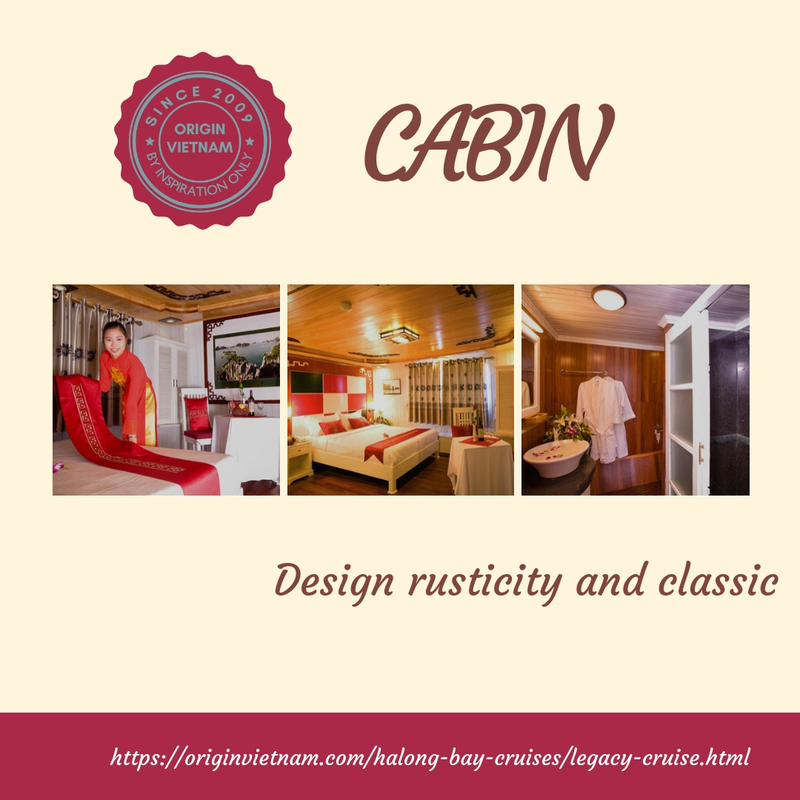 Rusticity and classic in design will give you truly Vietnam traditional images. The familiar concept will make you feel as in your home. The sunshine cabins never let you feel uncomfortable. Waking up the fresh air from sea and the spectacular dawn on Halong Bay. That will be the simple peace many people chasing in their life. The delicacy of boat owner expressing through traditional picture, the décor details as: furniture, curtain with ethnic patterns, lamps and more other things from the bedroom to bathroom. All the modern amenities are set up carefully to ensure your comfortable life as: the soft king bed, air-condition, hot and cold shower, minibar… that you will never have to think about the failure in working because the check regularly by technician staff. The sharing space as restaurant and sundeck are always on cleaning. The set menus or buffets of selective dishes from Vietnam traditional cuisine and international highlight will be served. Specially, the fresh seafood that was caught by fishing man in local floating village will always ready for all your parties anytime you’d love. Especially, if you'd like to experience something more unique, you can choice to have a romantic dinner on the beach, or even on cave. Of course, we will ensure for the safe and your wonderful feelings. This Cruise is run by a small team of young people. All of them have the deep passion on Halong Bay and Vietnam lifestyle. With the most enthusiastic attitude, they will take you into the "dare think, dare experience" itinerary of young. With the extensive knowledge about their childhood land. They will show you all the most of beauties aspects of this wonderful bay. Such as: the best route for kayaking, the best way to visit the limestone cave, the most beautiful coral viewing place… and even some of them, just only having in the memory of local citizen. You don’t need to be worry about where you could go in Halong Bay, you should care about what is your favorite choice. Don’t ignore the swimming time when the ship stopping in Bai Tu Long, or you can pass across the Titov Island. Climbing up to the peak of highest mountain, the amazing 360 degree view of Halong Bay will the best treasure you get in this journey. The night on boat will exciting by your own way. After dinner, bar lounge with all of the most delicious drinks from fruit juice, coffee and tea to the ocean cocktails in local style…will be wide opening welcome you. If you love something more adventure and need some lucky, let join with us in the interesting squid fishing tour. And then, let close your feeling eyes by the gentle melody from the sea in the cozy room. A deep and comfortable sleeping will help you get more energy to the next awesome day. Exploring Halong Bay is the long wonderful journey, but it will be more amazing if you choose right destination to stay with. The Halong bay cruise legacy is such vessel. Each of customers when come with the Cruise, when leaving, their luggage was been plus with the pleasure inside. To get more truly reviews of other customer, you can sign in TripAdvisor and other trusting travel app. To contact with Legacy Cruise or others luxury choice that more suitable than with your looking forward. Origin Vietnam is the address for you. The great team with extensive knowledge about tours and accommodations in Halong Bay will help you find the easiest way to answer all your questions. Or to anyone looking for a monopolistic journey, you don’t need worry about that. Origin Vietnam have the professional crew that always be ready to arrange all necessary thing perfectly to you. Let connect us at sales@originvietnam.com or browse in website: https://originvietnam.com.With all the highly honoring, Origin Vietnam will welcome you.